TUESDAY, July 12, 2016 (HealthDay News) -- Sufficient dietary levels of the mineral nutrient magnesium might be a boon to good blood pressure, new research suggests. The new study was led by Dr. Yiqing Song, associate professor of epidemiology at Indiana University's School of Public Health. According to the researchers, past studies that focused on the role of magnesium in regulating blood pressure have been relatively small, and produced mixed and controversial results. To help sort the data out, Song's group pooled the data from 34 clinical trials on magnesium supplements, which together involved more than 2,000 people. The daily dosage of magnesium supplements used ranged from 240 milligrams (mg) to 960 mg. Most trials had participants meet or exceed the U.S. Recommended Dietary Allowance for daily magnesium intake. Sifting through the collected data, Song's team detected a small but significant link between magnesium intake and healthy reductions in blood pressure. For example, the study found that taking about 368 mg of magnesium daily for about three months resulted in overall reductions in systolic blood pressure (the top number in a reading) of 2 millimeters of mercury (mm/Hg) and diastolic blood pressure (the bottom number) of 1.78 mm/Hg. Higher magnesium levels were associated with better blood flow -- another factor linked to lower blood pressure, the researchers added. 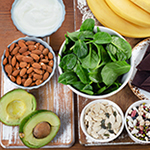 Still, the finding "underscores the importance of consuming a healthy diet that provides the recommended amount of magnesium as a strategy for helping to control blood pressure," American Heart Association spokeswoman Penny Kris-Etherton said in an AHA news release. "This amount of magnesium [368 mg/day] can be obtained from a healthy diet that is consistent with AHA dietary recommendations," said Kris-Etherton, who is a professor of nutrition at the University of Pennsylvania. That means that, with a healthy diet, it isn't necessary to take magnesium supplements, the AHA said. "As clinicians, we need to stress the importance of a well-balanced meal, not only for all the cholesterol lowering and sugar-modulating benefits, but for ensuring an adequate amount of magnesium in the blood," said Steinbaum, who directs Women's Heart Health at Lenox Hill Hospital in New York City. She believes that, based on the new findings, "checking magnesium levels as part of a screening for heart health may become an essential part of prevention and for treatment of blood pressure." The findings were published July 11 in Hypertension.